Steve, aka Ned, and his wife Ann live in rural Sullivan, Missouri, are charter members of the Missouri Bluebird Society and members of the North American Bluebird Society. Steve was recently asked to serve on the board of the Missouri Bluebird Society. He has built over 20 different types of nesting boxes for personal use and for sale. Steve monitors 4 bluebird trails for a total of 30 nesting boxes. Data and photos are taken and sent to the Cornell Lab of Ornithology for their Nestwatch program. Steve has been a citizen scientist for Cornell for over 10 years and has participated in their Project FeederWatch. To contact me send an email or call 636-629-8267. 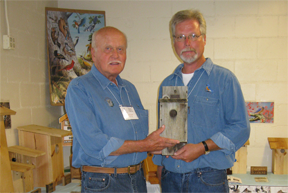 I was a featured speaker at the 2010 Missouri Bluebird Society Conference held in Jefferson City. My talk was about primary and secondary cavity nesters and began on an emotional note as I introduced my father, David, from Upstate NY. He is the person I credit for getting me involved with birds and the making of nesting boxes. This turned into a lifelong journey of being an avid birder and outdoorsman. The picture below is of my dad and I with a box we made back in 1977 that was still in use up until 2009 when I decided to replace it with a new box when visiting for Thanksgiving. For more on the Missouri Bluebird Society click here. At the suggestion of my friend Keith Campbell I've been working on some new nesting boxes for primary and secondary cavity nesters. Keith owns ECO Base Camp in Sullivan, MO and is in the process of making a walking trail through the camp that would include different nesting boxes and information on the bird that would nest there. For more information on all nesting boxes available please click here.